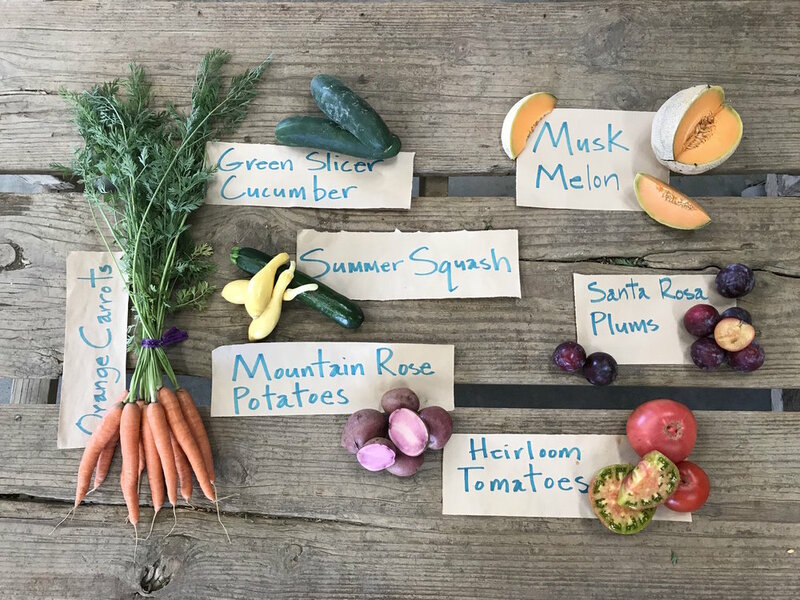 Box Notes: It’s another week of first appearances in the veggie box: first green beans, first cucumbers, and the first peaches! Summer crops are coming along at a nice pace. We picked our first melons today so they will be featured in your veggie box soon along with heirloom tomatoes. Field Notes: We got through last week’s heat wave and are feeling so relieved that the forecasted temperatures this week are expected to be in the mid 90s. Last week, the employees who work in the fields harvesting and weeding the crops finished each day by 12:30 pm. The temperature being 20 degrees lower - from 110 to 90 - makes a huge difference. But even on days when it’s above 80 degrees we take precautionary measures to ensure that the employees are staying hydrated, have easy access to shade and take extra breaks to prevent heat stress. Pork Shares are available. The pork shares are a combination of smoked and cured pastured pork sausage and bacon along with cuts such as ribs, chops, and roasts. During the summer months, we also offer a BBQ pork share that includes lots of ribs (country, spare, or baby back) and pork cuts and sausage for grilling. The pork shares are $8 per pound and range in total weights of 10 to 19 lbs. Please email the farm: csa@riverdogfarm.com to place an order!